The Beach Cabarita Lovely staff, so friendly. Apartment blew me away how beautiful they were! So close to everything. Overall amazing! The fridge door need to be hung the opposite way to make access easier. beautiful atmosphere with great facilites at our fingertips. It was a last minute booking and we had the most amazing room for an excellent price. Hotel suites The one bedroom unit we had, did not have 100% self catering facilities as was led to believe. There was no place to wash dishes, we had to do this in bathroom! Foxtel never worked at all. Unit clean and beautiful. Position of building in a super place. Reception and management welcoming! Situated by the ocean, this hotel is within 1 mi (2 km) of Nobby Beach and Burleigh Beach. Bond University is 2.6 mi (4.1 km) away. Conveniently located to beach, shops & restaurants. Miami Rice next door is a great family restaurant with excellent food. 'Ugh I need to get away.' How many times have you muttered those words? Quit Googling 'cheap holidays' and get going. Start with locking in a fabulous hotel in Cabarita Beach. Choose from 9 options within 5 kilometres of the centre and get your vacay on sooner rather than later. 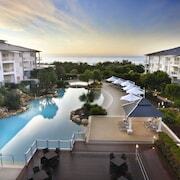 lastminute.com.au recommends kicking back at the Santai Retreat at Casuarina Beach and Cotton Beach Resort - Tweed Coast Holidays if you'd like to stay close to the main streets. 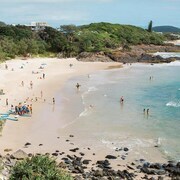 Visitors in the know often hit the hay in the neighbourhood of Coolangatta, 19 kilometres away from the heart of Cabarita Beach. It offers 28 different options, such as the Reflection on the Sea and Reflection Tower Two. 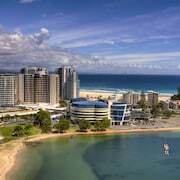 Tweed Heads, 17 kilometres from the centre, is yet another option for places to stay. Let's make it easy. The Tweed Ultima and Bayswater Tweed are our top picks. You may also like to stay at the Peppers Salt Resort & Spa, which is situtated 7 kilometres away. 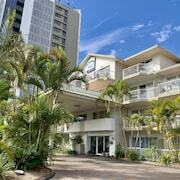 Or perhaps the Mantra Coolangatta Beach, just a distance of 19 kilometres from Cabarita Beach. 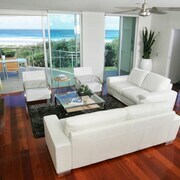 Others include the Kirra Beach Apartments, 19 kilometres away, and the Sanctuary Beach Resort, 25 kilometres away. Always on the hunt for your next big adventure? You'll be happy to know that the wider New South Wales region has some amazing things to see and do as well. The area is known for having amazing rural landscapes, beaches, coastal plains and mountains. After staring slack-jawed at nature's masterpieces, visit popular tourist sights like history museums and craft workshops. Additionally, if you’ve always wanted to go snowboarding, skiing and mountain climbing, you'll have the chance to in this corner of Australia. It's well known that Aussies just love to relax, so consider chilling out a little longer and checking out the Brunswick Picture House and the North Byron Parklands in Yelgun, 17 kilometres to the south of Cabarita Beach. The Ocean Shores Motel and Crabbes Creek Cottages are some of the long and short-stay options here. Or, you could consider staying in Mullumbimby, 25 kilometres to the south of Cabarita Beach, where you'll find The Middle Pub and The Mullum Motel. If you stay in Mullumbimby, set aside some time to check out the Tyagarah Tea Tree Farm and the Crystal Castle & Shambhala Gardens. Just touched down? It won't be too long before you can ditch your uncomfortable cabin seat for a swanky bed! The Golden Shores Airport Motel and the Gold Coast Airport Accommodation - La Costa Motel are pretty close to Coolangatta Airport, which is just 20 kilometres from the centre of Cabarita Beach.